For 2,000 years Japan had never been defeated. There was no word for "surrender" in the Japanese dictionary. And although the Japanese government never believed it could defeat the United States, it did intend to negotiate an end to the war on favorable terms. It hoped that by attacking the fleet at Pearl Harbor it could delay American intervention, gaining time to solidify its Asian empire. 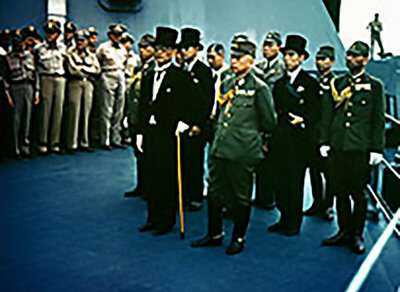 Then it planned to fight a decisive battle that would bloody American forces, forcing the U.S. to negotiate a peace and leave Japan's old order, the emperor and the military government, in power. After losing the Mariana Islands and the Battle of the Philippine Sea in July 1944, Japan realized that the decisive battle was likely to be fought on Japan's main islands. In January 1945 Japan's high command anticipated exactly what the U.S. would do -- and began to plan for it. Japanese strategists predicted correctly that Americans would assault the islands of Iwo Jima and then Okinawa, where the Japanese hoped fierce resistance would force a negotiated peace. The Japanese also prepared for an invasion of Japan from Okinawa. American fighter planes' range indicated where the landing would be -- on the island of Kyushu. From Kyushu, planners predicted the Americans would try to launch an invasion of Tokyo. The Japanese called the final decisive battle on the main islands Ketsu-Go. The Japanese strategy was to destroy the invader's landing vessels before they hit the beaches. For this purpose, Japan had reserved about 5,000 conventional aircraft and a variety of suicide vehicles, including about 5,500 kamikaze planes, 1,300 suicide submarines, and several hundred piloted bombs. 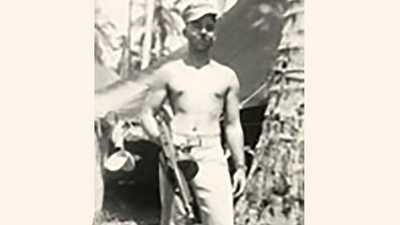 There were even frogmen, wearing explosives, who would blow up landing craft — and themselves. The invaders who made it to shore would face Imperial Army divisions expected, as always, to fight to the last man. Civilians were recruited to fight alongside the soldiers with sharpened bamboo spears. The government held up as a model to civilians on the main islands the civilians on Saipan who had jumped off cliffs rather than surrender. Richard B. Frank, author of Downfall: the End of the Imperial Japanese Empire, describes their position: "In their war gaming of Ketsu-Go, the Japanese had worked out that they could destroy up to a third of the invasion force while it was still afloat. If you consider how General [George] Marshall recoiled when he saw the defense buildup in early August, I think the Japanese had a substantial basis to believe that Ketsu-Go could deliver something to them better than unconditional surrender." Although the Japanese emperor, Hirohito, had approved Ketsu-Go in January, it was presented to him again on June 8 by a new government. Every government sought the emperor's sanction for its plans. That day the emperor and his war cabinet also considered reports that doubted Japan's ability to continue the war. One report stressed its industry was wrecked, local police were concerned about popular unrest, food was short, and if the fall rice harvest were low, there could be mass starvation. Other reports said the Imperial Navy was sunk and the Imperial Army in China depleted. "And everyone says, 'Well, yes, but let's fight to the bitter end.' The extremity of their situation actually propels them to seek a decisive battle before their condition becomes so hapless, they can't even do that," recounts historian Edward Drea. Japan's government was ruled by consensus, and the emperor's role was to sanction its unanimous decisions. Nonetheless, after the June 8th meeting, both the emperor and his chief adviser, Marquis Koichi Kido, were troubled. They began to seek a diplomatic solution, asking the Soviet Union to mediate an end to the war. Two weeks later, on June 22, the emperor did something highly unusual. He opened a conference with his war cabinet by announcing he wanted to send a special envoy to Moscow. The war cabinet agreed for different reasons. The peace faction hoped it would lead to peace. The hard-liners hoped it would keep the Soviet Union, which had recently ended a neutrality agreement with Japan, from declaring war. On July 27, when Japan's government ignored an Allied ultimatum from Potsdam, warning of "prompt and utter destruction" unless it surrendered unconditionally, it was still waiting to hear from Moscow. On August 8, the U.S. dropped the world's first deployed atomic bomb on the Japanese city of Hiroshima. The Soviet Union declared war on Japan and invaded Japanese-held Manchuria on the night of August 8. The war cabinet met to consider peace terms for the first time the next morning, learning while they were in deliberations that the Americans had used a second atomic weapon on Nagasaki. Government hard-liners still held out, hoping not only to maintain the imperial system, but also for other terms designed to preserve the old order. They even hoped to avoid a U.S. occupation. The emperor had to intervene twice, on August 9 and 14, to break deadlocks in his war cabinet and get it to accept the Allies' terms. On August 15, Japanese citizens heard the emperor's voice for the first time, broadcasting news of the nation's capitulation -- without once using the word "surrender." Yoshiko Hashimoto and her baby survived. 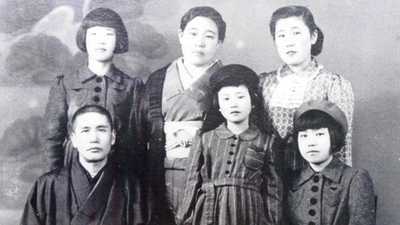 But as many as 100,000 Japanese civilians, including her mother, father and a sister, perished in the firestorm of March 10, 1945. For Jack Hoag and George Niland, with the 6th Marine Division, the future seemed bleak.